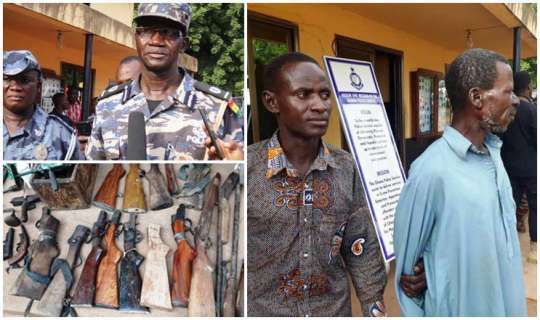 guns that are suspected to be used by criminals to carry out robbery attacks in the region. grinder machine and a box of tools were seized from the suspects. Regional Deputy Police Commander, ACP Peter A. Ndekugri, told Journalists that the suspects were arrested on Monday after an officer on duty at Loho police barrier near Kaleo arrested one Nyame Purokiamah aged about 61 who was returning from his farm with a local single barrel shotgun. was handed over to him by his grandson Michael Sonkara aged 32 to test it. from one Bartholomew Daryenkye at Charia, a suburb of Wa. house of Bartholomew Daryenkye, where the multiple guns were retrieved. guns for criminals to operate,” he said. necessary safety for lives and property. August 9, 2018 in Business, LifeStyle.